Strabane’s Sean Devine emerged victorious at last weekend’s NI247.com Circuit of Ireland National Rally after a thrilling battle with Cookstown’s Glenn Allen. 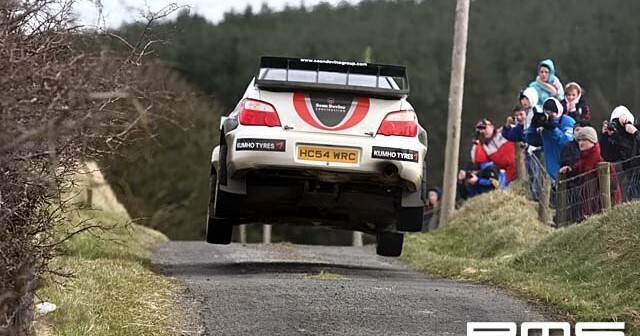 As round three of the Pacenotes MSA Northern Ireland Stage Rally Championship, almost 100 crews arrived at the start ramp for the two-day Easter event, which started and finished in Castlewellan. It was Devine and navigator Damien Duffin who led from the start in their Subaru Impreza WRC, going fastest on the rally opener by five seconds from Sean McArdle and Gerard McMonagle. Neil McCance and Sean Ferris were third in their Group N Lancer, while Cookstown sizzler Allen was taking some time to heat up in fourth overall, as he suffered with a broken intercooler pipe. Devine continued to set the pace through Saturday’s early stages, but Allen finally broke his duck on stage 10 when he went fastest. Navigated by Damien Connolly, the reigning champions were quickest again through stage 11, but Devine was soon back on form. Going into the day’s final stage, he had amassed a lead of almost half a minute from Allen with Connor McCloskey and Francis Regan third, but that was set to be turned on its head. Devine’s dramas allowed Allen to hold an overnight lead of 14.6 seconds, with second placed Devine less than 27 seconds ahead of McCloskey. It was still anyone’s rally, and with another six stages on the cards during Easter Sunday, the scene was set for a thrilling final day battle. McCloskey was quickest out of the blocks on Sunday morning, setting his first fastest stage time with his newly acquired Subaru Impreza WRC S12. Then it was second placed Devine who was back on the ball, reducing Glenn Allen’s lead to less than five seconds in one deft swoop! One stage later, Devine had nipped into the lead by one second, and although Allen fought hard in his Corolla WRC, he failed to stop the Devine steamroller. Fastest on each of the remaining stages, it was Sean Devine and Damien Duffin who arrived in Castlewellan victorious, with Glenn Allen and Damien Connolly settling for second ahead of Connor McCloskey and Francis Regan. Outside the top three, Neil McCance and Sean Ferris arrived home in fourth overall and first in Group N, with Sean McArdle and Gerard McMonagle taking fifth ahead of Colm McFall and Donal Lennon. As already mentioned, the battle for Sunoco Fuels Group N honours was won by Neil McCance and Sean Ferris. They led the category from the start, with Alan Carmichael and Ivor Lamont holding an early second from Enda McNulty and Declan Campbell. McNulty later retired after visiting a field, while John Walker and Cathal Rogers also retired during leg one. There were no such troubles for McCance though, and he accelerated to the finish line in first position. Head and shoulders above his category rivals, he sealed the production category win as well as fourth overall, while Alan Nesbitt and Quentin Park arrived home in second ahead of Alan Carmichael and Ivor Lamont. The Superdrive two wheel drive category saw a jubilant David Armstrong and Duncan MacFarlane emerge victorious. After a tremendous battle with John Waring and Mo Downey, Armstrong took victory, as well as ninth overall, by a slender nine seconds from Waring. Michael Conlon and Aidan Boyle finished third among the two wheel drive men, with Fintan McGrady and Conal McCartan fourth ahead of James Kennedy and John Rowan. 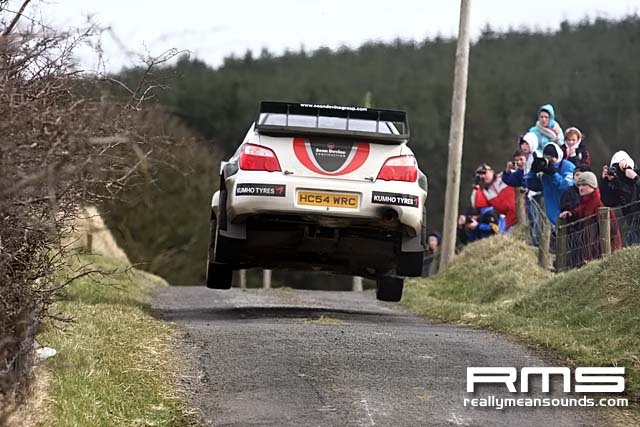 With Easter falling early this year, the Pacenotes championship has a break of almost two months before the KBB Tour of the Sperrins gets underway. Based in Maghera, the event is the second closed road rally of the season, and it starts from Walsh’s Hotel on Saturday 17 May. More details will be announced in due course on the official championship website – <a href=”//www.nirally.com”>www.nirally.com</a>.